A Bird With A Catlike Name — And Sound The world is full of unusual animal sounds — and among the more unusual is the call of the bare-throated tiger heron. Greg Budney, a biologist from the Cornell Laboratory of Ornithology, recorded one of these long-legged wading birds in Guatemala. The bird, he says, makes him "think of a large cat." A bare-throated tiger heron (Tigrisoma mexicanum) rests on the banks of Tarcoles River in Costa Rica. 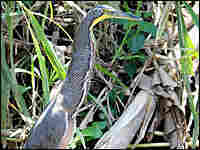 The world is full of unusual animal sounds — and among the more unusual is the call of bare-throated tiger heron. 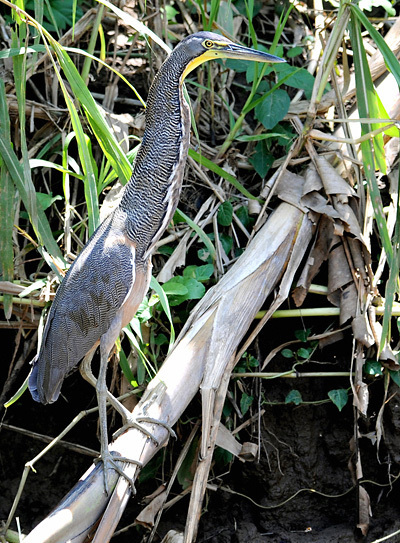 Greg Budney, a biologist from the Cornell Laboratory of Ornithology, recorded the call of one of these long-legged wading birds in Guatemala. The heron, he says, has "spectacular plumage" like the markings of a tiger, only closer together. But that's not the only resemblance. "The moment you hear its voice, you can't help [but] think of a large cat," Budney says. Budney's recording was made around nightfall, when the herons begin to call. He had been sitting around a campfire in the wild. "As it vocalizes, it extends the neck outward about as far as it can possibly go. It gives this deep, low sound," he says. "I had never heard one really close up like this," he says, "and we just all looked at each other around in the camp, in the light of the fire." 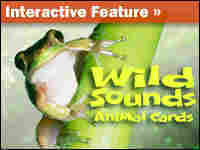 NPR's Christopher Joyce tracked down these recordings of animal sounds.